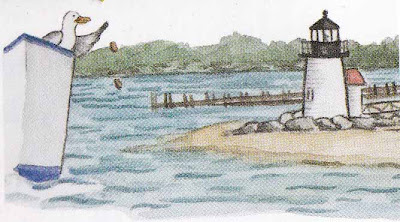 Toss two pennies overboard as you 'round Brant Point to ensure a save return to Nantucket! What a great time I've had on my virtual (blog/dream/I wish) vacation to Nantucket! Such a pleasant escape from the 87 loads of laundry I have waiting for me compliments of children and husband out of school with not much better to do than wear things and throw them on the floor, but I digress... back to Nantucket. 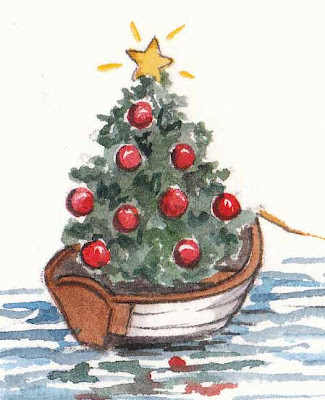 It's not too early to start making reservations for the annual Nantucket Stroll held the first weekend in December. What a perfect place to jump start your holiday shopping! Check out the details on the Nantucket Chamber of Commerce website. 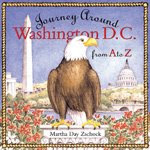 How about a copy of "Journey Around Nantucket from A to Z" for everyone on your list? The perfect way to learn more about this lovely island and remember your vacation! Having fun on Nantucket?... I am... at least on my vicarious blog vacation! 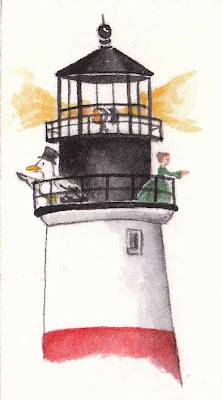 Don't you love Nantucket's lighthouses? Even if you live east of nowhere and have never been anywhere in your life, you've probably seen a picture of one of these beloved landmarks that have a long history of safe guarding vessels. As you don your bikini today, here's something to chuckle about... (or impress your buddies with as you play 18 holes).... During the 1850's, the viewing platform of Sankaty Head Light had to be widened to accomodate ladies' fashionable hoop skirts! Not quite as comfortable as today's fashions (except maybe those skinny jeans in which case I'd choose the hoops)! Greetings from Nantucket! (Or so I wish). If you're just joining me, come along... 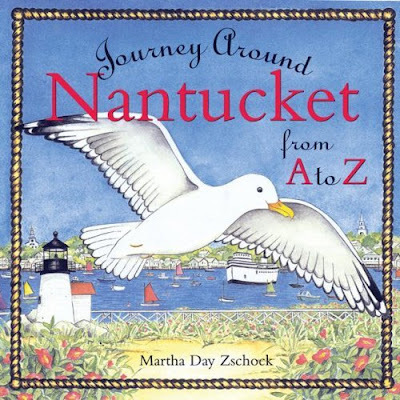 I'm on a blog vacation to Nantucket this week, revisiting many of the sights and scenes I discovered while researching my book, "Journey Around Nantucket from A to Z". Are we tired of July traffic yet? Let's hop on our bikes! 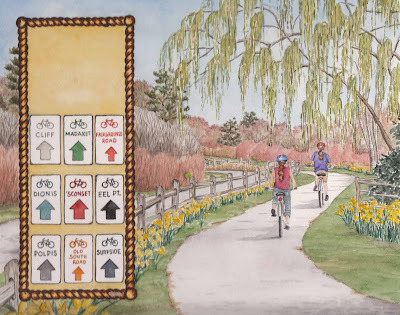 Because Nantucket is so small- about 14 miles long and 3 miles wide, it's the perfect place to bike... and the island has over 24 miles of paved paths! Look for the color coded signs to point you in the right direction..... Passing, on your left! Ok, so technically, that's a comet in the picture, but I think we can wish on it anyway. This week, I'm wishing for a Nantucket vacation, please join me! 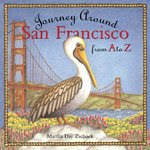 Today I think it would be fun to take the kids to explore some of the Maria Mitchell sites. She was such an inspiration... at a time when many women didn't have many choices other than to be wives and mothers, she became an astronomer, educator, and the Atheneum's first librarian. In 1847, she discovered a comet and was awarded a gold medal by the king of Denmark! Let's have some fun exploring her house, an aquarium, and two observatories that are operated by the Maria Mitchell Association (see link above). There are many fun programs for kids offered. 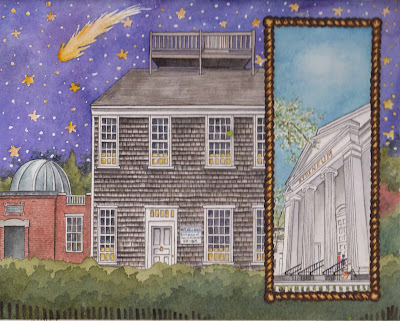 Also check out Nantucket's library, the Atheneum. Such a grand building derserves a grand name! I love the original children's book art from various Nantucket books in the children's room. While you're there, kids can join the summer reading program and you pick up a relaxing book for yourself! Thanks for joining me on my blog vacation to Nantucket this week. 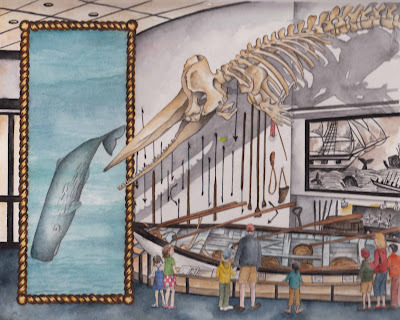 I know, I know, it's summer and you want to head to the beach, but I highly recommend a visit to the Whaling Museum at some point during your visit. From the early 1700's to the mid 1800's, Nantucket prospered as the whaling capital of the world and the downtown area bustled with businesses outfitting ships for long voyages that often lasted several years. Part of the Whaling Museum was an old factory that made candles from whale oil. 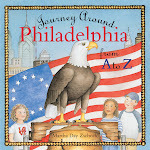 The museum has a great booklet for kids to follow as they tour the museum. Hold on to your hats... With the cry, "Thar she blows!" small rowboats were sent off the whaling ships to harpoon the whale. Once hit, the whale took the crew on a wild "Nantucket sleigh ride." After three weeks of cleaning up after children and husband who are all out of school for the summer (and providing sherpa, chef, laundry, taxi, and referee services on the side), I've decided it's time for a vacation since I'm not getting anything done anyway. How about Nantucket? Well, if I can't actually go, at least I can pretend I'm there... can't I? 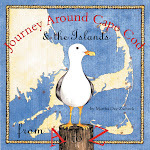 Pack up your Nantucket Reds and join me this week on a blog vacation to Nantucket! Fun Factoid... Native American Wampanoags, Nantucket's first inhabitants, gave the island its name which means "faraway land". Many island locations have maintained their native names: Monomoy- "Black Soil" and "Siasconset- "Place of Bones". Welcome to my journey! 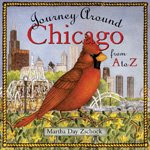 I am the author/illustrator of the JOURNEY AROUND series. My husband is a teacher, as was I, and we have two beautiful daughters, ages 9 and 6.